Was born in 1873, and educated at Eton and Sandhurst. He entered the Royal Horse Guards as Lieutenant, and served from 1894 to 1896. He saw service in South Africa in 1899-1900. Sir Samuel is a well-known yachtsman, being owner of the fine s.y. Golden Eagle, 445 tons, the s.y. 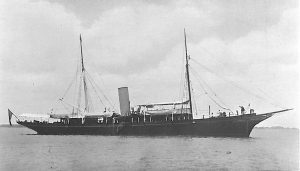 Rover, 19 tons, and the Westra, 24-footer, built by Sibbick at Cowes in 1895. Sir Samuel has taken great interest in yacht-racing in the Solent and cruising in British and Mediter­ranean waters. Residence: 33, South Street, Mayfair.